Junk food is a term used to describe food that has lots of kilojoules and little or no nutritional benefits. These empty kilojoules are most likely coming from unhealthy fats and added sugars. The combination of excess salty, sweet and greasy flavours make children want to eat more, eventually becoming too full to eat nutritious food. By creating positive eating habits for your children, you’ll help create healthy adults with a solid understanding of the food they choose. Often, getting kids off their go-to junk foods will be met with resistance, screaming battles and tears. Rather than leaving a junk-food-shaped hole in eating routines, try replacing unhealthy food habits with healthy ones. new foods. Remember, this can take many tries, so constant exposure and persistence is key. Show kids how fresh, wholesome ingredients look, feel and smell before they go onto the plate. Measuring out ingredients for a recipe, cracking the eggs or dressing the salad will help them practice important life-skills and be more savvy with handling foods. Additionally, involving them in preparing home meals and lunchboxes can increase the chances of them eating it. Whether it’s nachos, fish and chips or even pizza, homemade versions are a good way to make sure food has nutrients. For example, a wholesome version of fish and chips could be crumbed fish and sweet potato wedges, baked in the oven. Work towards adding more veggies into their favourites, such as grating carrot into nachos or getting the kids to use colourful veggies as toppings for a rainbow pizza. Starting meals from scratch helps you control what goes into your family’s meals, cutting down on additives and preservatives found in commercial food. Even if you have the healthiest, junk-free kitchen, you can’t always monitor what your kids are offered outside the home. They might also feel like the odd one out at birthday parties if all the other kids are allowed to eat cake, chips and lollies. Start with a healthy snack pre-party and then let them know that they are allowed to eat the fun, ‘sometimes’ foods, suggesting they choose a small helping of 2-3 of their favourites. At the end of the day, it’s important to make sure any changes are sustainable for you and your family. 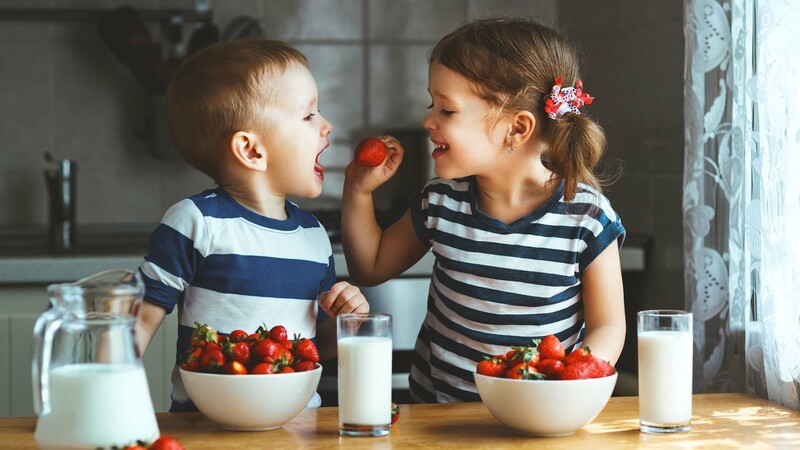 Children are surprisingly observant of what adults are eating and doing, which means that the best results are seen when the whole family gets on board. Walk your talk and show them that healthy eating is easy and good for everyone.